First up is my new yummy perfume 'Scarlett' by Cacharel, this scent is beautiful. I like my perfumes to be sweet and this is very. It has quite a tropical smell to it, very fruity and fresh. It's my new favorite. The bottle is also beautiful, very vintage looking! If you spend over £10 on perfumes then you get a free goodie bag, how fun! I love free things. I got a mini straightener, Barry M lipgloss tube, Versace perfume travel bag, two lipton ice teas, two skinny cow hot chocolates, toothpaste and a lollipop! In my local town there is NO Sleek collection, boo! So i had to go a bit further to get this, my next town which is about an hour away had a pretty good selection. I wanted to pick up another Sleek palette but they didn't have the one i wanted. I got myself the Sleek Glo Highlight in Peach Shimmer - i am so impressed with it! It is so well pigmented and gives a gorgeous golden shimmer which is lovely and subtle. The brush it comes with is also pretty handy - perfect for your handbag! This ColorSensational by Maybelline - Pink Pearl lipstick is gorgeous! I am in love with the pink! I am going to keep this short and sweet because it definitely deserves a blog post of it's own. 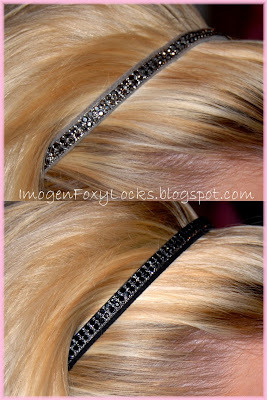 These hairbands from River Island are so cute, made from leather and dark crystals (which look more like studs). They are elastics so they help to create volume behind. LOVE! How beautiful is this ring from accessorize?! I saw it and fell in love. I always wear statement rings, the detail on this is gorgeous. The pearl in the middle is wow! I bought some more goodies from Accessorize. I have been looking for both a cute pair of ear muffs and fingerless gloves/mittens for awhile and i found the perfect ones. These courts from Dorothy Perkins are gorgeous!! I love the gold studs around the hidden platform heel. (sorry it's black and white i couldn't bare to show how pale my feet were haha:). I think these shoe/boots are so cute, but i'm not too sure if i'm going to keep them because i have so many like them. These are also from Dorothy Perkins. Last up is my very pretty grey scarf from River Island. It has sequin detailing on it which looks beautiful. For some reason i always seem to buy grey scarves. So that's it for today. Will be doing more detailed post on a few of the make-up products. I hope you like what i got! LOVE Everything! I can't believe I just found your YouTube Channel. OMG! I just want to take all that stuff and keep it for myself! Were was the perfume from..
Imogen i wrote a blog post about you.. I love that Accessorise ring (and the nail varnish). Fab haul, good work!! I loved every single thing you bought!! Literally love everything you got!